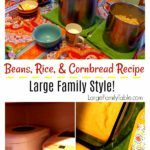 Jamerrill's Beans, Rice, and Cornbread Recipe | Large Family Style! 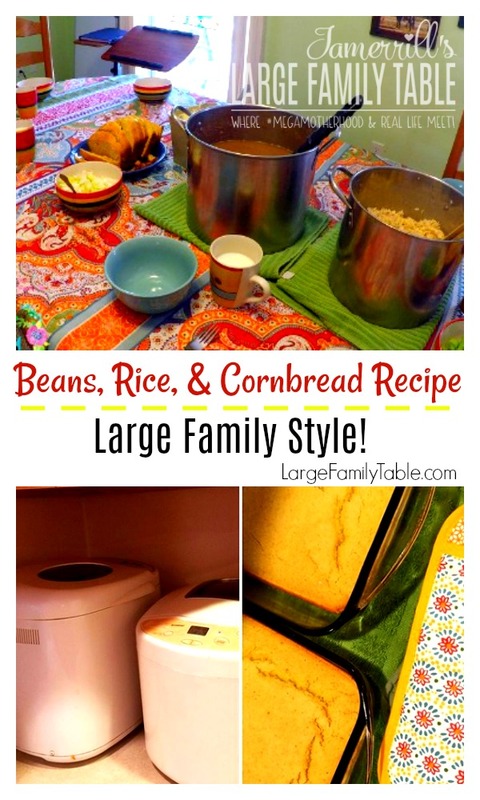 Jamerrill’s Beans, Rice, and Cornbread Recipe | Large Family Style! I shared a picture on Instagram a few weeks ago with my weekend meal plan. I mentioned how I was making a large pot of beans, rice, and cornbread per my husband’s request. Several moms asked me for a cooking vlog with how I cook my beans, so here you go… Jamerrill’s Beans, Rice, and Cornbread Recipe | Large Family Style! In the video, I’m using Pinto Beans and Brown Rice. I also share my Breadman Bread Maker and the bread maker that I found at the thrift store for $3. You can find my Cornbread in the Bread Machine Recipe here. If you’ve never cooked dried beans before, you will be surprised by how easy they are to do! And the rice practically cooks itself. Add 8 cups water to a large stockpot for rice. Turn on high and bring to a boil. In the meantime, rinse beans to remove any dirt or small stones. Put in a large stockpot and cover with water by several inches. Add a whole chopped onion. If your rice water is boiling, add 4 cups of raw rice and stir it in. Turn rice off, cover, and let sit at least 15 minutes until done. Stir beans every so often to check water levels. Add water if needed. When beans are done, serve by adding a scoop of rice to a bowl, top with beans, and sprinkle raw onion over if desired. I like hot sauce, so I add a few dashes of that to mine! 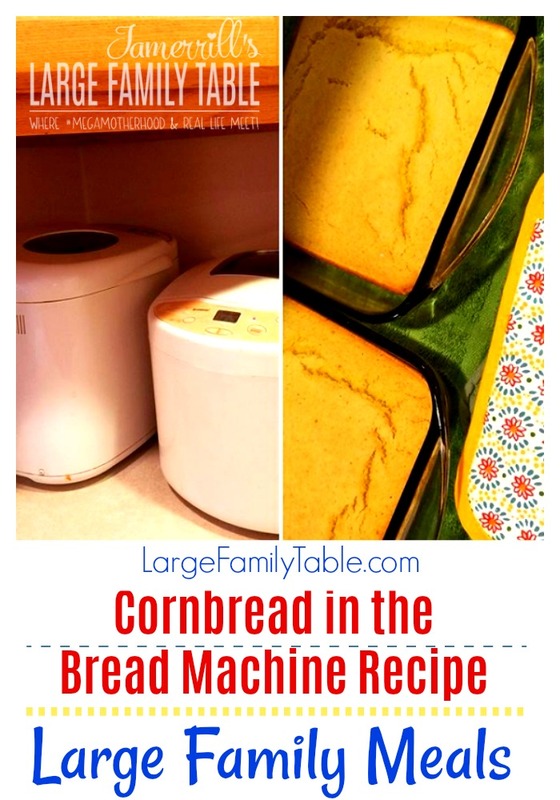 Click here for the full directions of making Cornbread in the Bread Machine for your next large family meal! Here are more recipes from my kitchen! *Remember you can always use the promo code HELLO20 to take 20% off your first order in the LFT shop including the best-selling Large Family Freezer Meals Collection with freezer meal packs 1, 2, 3, 4, 5, 6. 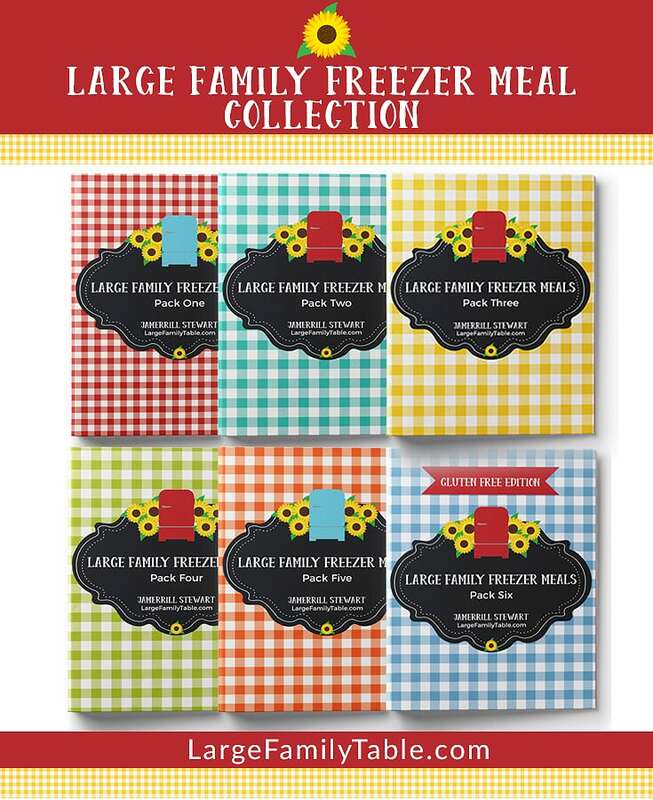 These Large Family Freezer Meal Packs include the freezer meal grocery shopping list, big batch cooking guide, freezer meal recipes, freezer cooking printables and more! Looks yummy! Do all the kids enjoy this? Might try it soon! Thanks for sharing ! Do you have the recipe written out? I’m sure it’s here and I just can’t find it, I am struggling to write it down from the video. Ours turned out good, we served it with sour cream and shred cheese too ! We are soup beans twice a week growing up. It is very filling and very frugal.? Now I do the same thing for my family. Have you ever tried it in the crock pot and do you always use pinto beans ? I put dried beans in slow cooker with a ham hock. So delicious! I cook with a bay leaf and water covered by an inch overnight. I cannot imagine making them another way. Please try them in a slow cooker. At my house we love a good pot of Red Beans and Rice 🙂 Lots of onion and bell pepper. We too love the nice broth that forms after the beans have cooked down. I have an Oster Bread machine just like your’s that I found for $10 at a garage sale! I need to get it out and try it! Your cornbread looked great. 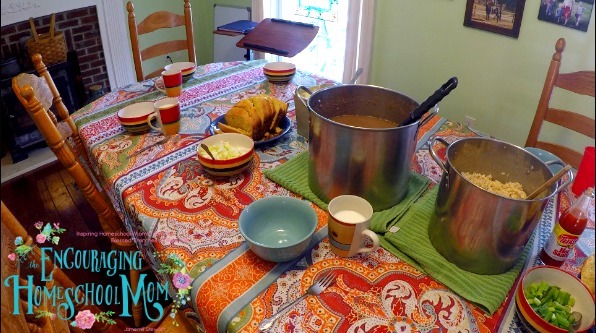 I follow Trim Healthy Mama, but there are sometimes I will have an off meal as well. Thanks for sharing our encouraging videos. I always enjoy them! We raise chickens as well! I don’t have a bread maker so could I just mix the recipe in my stand mixer instead? Would it still turn out okay do ya think? If you ever have a ham bone left over it goes great in the beans! I grew up eating soup beans like this with either a ham bone or ham hawks. You should try the crock pot! It makes them even easier then they already are because you can make them without even being home or overnight! Throwing the corn bread in our bread machine right now! Letting it bake while we get put of the hose for awhile. 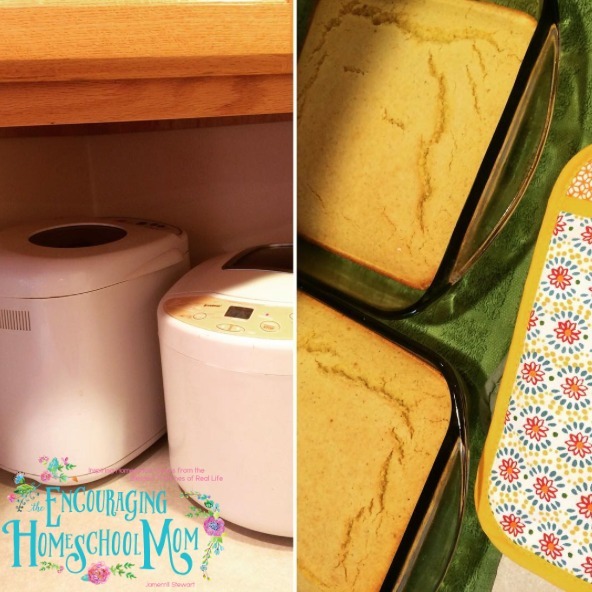 My children love corn bread. This will be a hit! Thank you!